Reality is a tempting thing to ignore. All those inches, centimeters, cubic feet. Who wants to keep track of them. Who needs a painful bargaining with physical world. This is more or less what I was thinking when observing a pile of our of luggage assembled haphazardly in front of the suddenly and painfully shrinking truck. It was clear, well, to me it was clear, that we cannot take everything. No superpowers that I and my better half posses can squeeze everything into the car. But I know better than to argue. I don’t really do hardware in this arrangement conventionally known as marriage. Come to think of it I do not really do hardware in any arrangement. So I patiently handed over bags. Rearranged packages. Carried our bikes in and out.And finally it worked out much better than I suspected. We could take nearly everything that we wanted. With the exception of skis and some winter gear. But winter is far away and we figured out couple of ways we can retrieve our stuff. In the meantime I can get back to ignoring reality. Everyone should try it from time to time. Natalia thinks our truck looks like a fully loaded camel with its humped cap. I hope it’s her imagination but she swears it sunk into the ground a bit after we finished packing. At least we carry our books and music electronically now - can’t wait for those digital clothes. 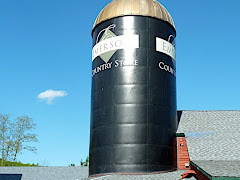 Ever traveled the countryside and wondered what farmers hide in those huge silos by the barn? Now we know: the world’s largest kaleidoscope. Well, they can’t all be the largest… You lie on your back, gaze up for 10 minutes watching American History show and let me tell you: nothing reinforces patriotic feelings toward this great country like swirling presidents’ heads set to dramatic music. Interspersed with floral patterns and marijuana leaves. 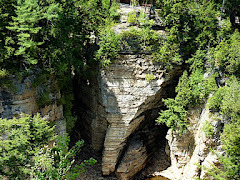 Falls are in abundance in Adirondacks, and Ausable Chasm is one of the largest and prettiest. Or it would be, if not for its economic exploitation. The chasm is fenced, but not to protect its ecology from people, or people from falling into it, but to prevent you from getting a closer look without paying an admission fee. It costs $5 for a peek and $16 to hike around. Despite the price you do have to hike yourself. Although in the season they’ll actually shuttle you back to the parking lot, so you don’t have to walk back and look at the nature for too long. In case you don’t find the chasm and the falls appealing enough, countess related activities are provided: tubing, rafting, lantern tours, historic tours - you get the idea.